Tampa Bay Kids’ Kitchen is a pop-up kitchen for plant-based cooking at youth gardens. November 3, 2018, Turner-Bartels K-8 students learn about quinoa and how to make a harvest salad from Kids’ Kitchen presenters, USF students Yara Khalil and Richa Bisht during the Grand Opening of the new outdoor garden classroom. Tampa Bay Kids’ Kitchen is a pop-up mobile service designed to bring affordable, plant-based cooking lessons to youth gardens. JUNE 2018, LI ZHU ASSISTS A STUDENTS WITH CUTTING STRING BEANS AT A COOKING LESSON PRESENTED BY HILLSBOROUGH SOCIAL SERVICES & JUNIOR CHEFS OF AMERICA AT THE OAKS AT RIVERVIEW COMMUNITY CENTER. December 11, 2018, Kids’ Kitchen team members Christiane, Brooke, and Richa prepare Garden Fiesta Tacos for kids enrolled in the Tampa Heights Community Garden after school program led by Kitty Wallace. June 2018, Yara Khalil assists a student with cutting string beans at a cooking lesson presented by Hillsborough Social Services & Junior Chefs of America at the Oaks at Riverview Community Center. We are so very excited to announce the roll-out of our brand new mobile Kids' Kitchen, funded by Sprouts Healthy Communities Foundation, on Nov. 3 at the Green Apple Day of Service at Turner-Bartels K-8. On this very special day - a year in the making - TBK8 students, their families, and volunteers with Grace Empire Church, the Patel College and TTF2S will complete the set-up of the 4th grade gardens. Adding to the excitement for the incoming 4th graders, the students will also be treated to a cooking demo by our Kids' Kitchen intern cooking team. USF student interns will engage young gardeners in a demonstration of how to prepare a simple dish using the same type of vegetables they will grow in their new gardens. 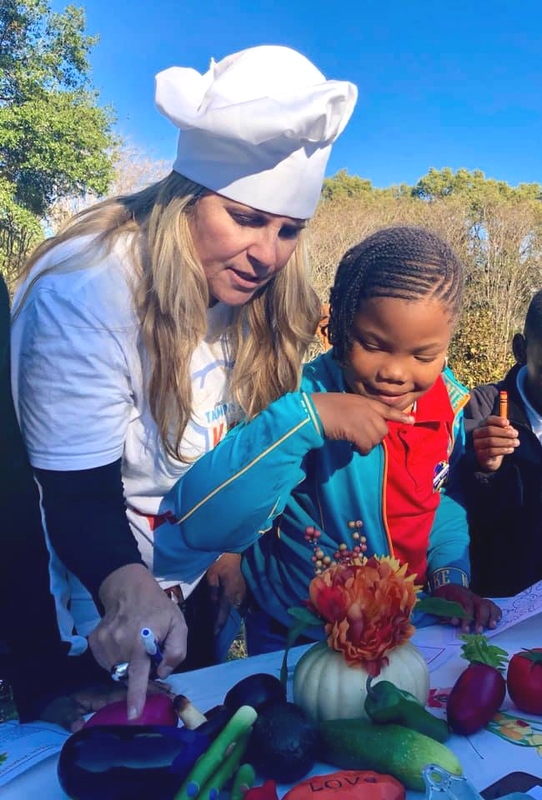 Helping students make the connection between the vegetables that they grow in their new gardens and the healthy plant-based dishes they can make at home is an important goal, fulfilling the TTF2S vision of "Healthy Communities, Seriously Healthy Food." When USF undergraduate honors student Yara Kahlil approached TTF2S at the USF Patel College open house in the spring of 2018 asking for an opportunity to cook with kids, we said, "YES! LET'S DO THAT!" Fulfilling our vision of fostering healthy communities requires more than just building school gardens and supporting hands-on agricultural experiences for kids. We must also show young gardeners how to use what they grow to make healthy food that tastes good. Check out Yara’s cooking videos here.